Houston Auto Locksmith Service | Car Locksmith ASAP | Call Now! Locked out of your car somewhere in Houston? Or maybe you can’t lock your vehicle? No worries, because we can help! Call now and our team of car locksmiths will solve the problem for you! One of the things that make us your best choice of all the locksmiths here in Texas is that we have mobile teams that can come to help you quickly. Whether you live in Braeswood, or the Upper Kirby area, really anywhere in the greater Houston area, or if you get locked out of your car at the office or while you're out shopping, we have locksmiths on call nearby who will be able to come to you and deal with the problem on the spot. Save our number because you never know when an emergency will happen. By calling us, you will be able to deal with it as quickly as possible. Because we have teams in every part of Houston, our locksmiths can come to you in less than half an hour. And once they’re there, you can be sure it will not take them too long to fix the problem. One of the most common reasons why people need our locksmith services is to deal with car lockouts. Problems like these happen all the time, which isn’t surprising. After all, you can get locked out of your car just by slamming the door shut while the car keys are still inside. Furthermore, you can also get locked out if your car lock breaks or if the key gets stuck in it. Whatever the reason might be, you surely don’t want to walk all the way home to get the spare keys (if you have them at all). A much simpler solution is to ask our automotive locksmiths to come to you and let you back in your car. You should know that this is a task that they can handle in a matter of seconds. So, don’t waste your time; if a car lockout happens, call us! Losing the keys is one of the most frequent reasons why car lockouts happen. If this happens and you have no spare ones, there’s no way you’re going to be able to get back in the car without the help of locksmiths. Opening the car doors is the easy part. What’s difficult is making new car keys without access to the original. Because this is a very tricky thing, not many locksmiths in Houston are actually able to do it. But, don’t worry, you have us! 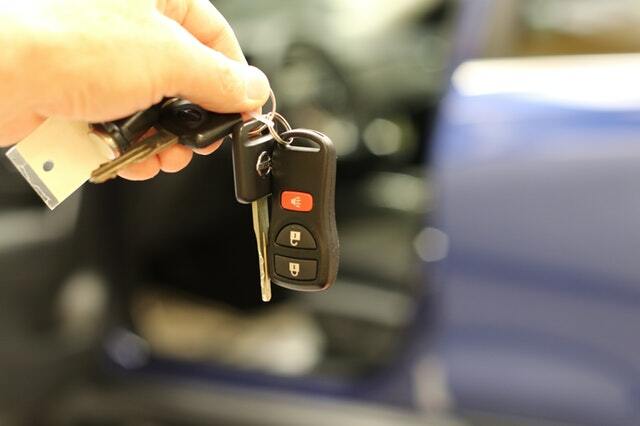 We have expert locksmiths on our team, who use sophisticated equipment which enables them to create any kind of key, based on nothing else but the car lock. The crime rates in Houston have been dropping down recently and one of the reasons for that is that the county’s residents have become security-conscious. To help the number of car thefts in the county go even lower, you can play your part. You can make your car unbreakable! If the locks on your car are old, car thieves will not have too many problems picking them. The solution is pretty obvious – call us to replace them with new ones. And calling us is basically the only thing you need to do; we’ll take care of all the rest (helping you choose the best locks, installing them, testing them, etc.). If the lock on your car breaks, it can get you in a very unpleasant situation. To prevent that, you can ask our locksmiths to take a look at your car locks. They will test them to see whether they can serve you well for a long time, as well as to check how hard they are to pick. If the locksmiths find that there’s something wrong with the locks, they can fix them right there on the spot. Furthermore, if the locks are beyond repair, they can replace them with new ones. It’s not only car locks that we deal with; our locksmiths can deal with any kind of lock on any kind of vehicle. So, if there’s something wrong with the locks on your truck or motorcycle, we’re the ones to call. We can help you with locks on the doors of your vehicle, but also with ignition locks, trunk locks, etc. And it really doesn’t matter who’s made the vehicle you own. We service all the common vehicle brands found on American streets, including Chevy, Nissan, Volkswagen, Ford, Chrysler, Audi, Jeep, and many, others. We understand that car lock problems don’t pick time or place, which is why our mobile teams work 24/7. At any given time, there are at least a couple of locksmiths in your area who can help you with your car lock troubles. In order to get ahold of them, all you need to do is call us! It also doesn’t matter what day of the week it is – we work weekends as well. We even have emergency locksmith teams working on holidays, such as New Year’s Eve, who will be there to help you if an emergency occurs. Is your car lock giving you trouble? Don’t let it wreck your nerves, because the solution is easy. If you’re somewhere in Houston, all you have to do is call us and our automotive locksmith team will come to you in 20 minutes to help you out!